With the expanded interest in Mount Soma, the Student Union is a much-awaited addition, providing a place for course participants to stay, eat, and visit with others in the community. 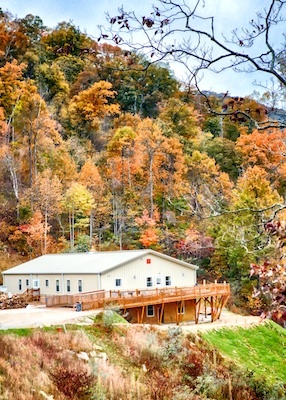 It is home for the Mount Soma Ashram and also provides staff offices. Behind the Student Union is the Yagya Shala. Sri Somesvara, Maha Nandi, and the Visitor Center are all a short walk away. With the help of several generous grants from the Germeshausen Foundation, CRS Learning Center was able to build the Student Union. CRS (The Center of Rational Spirituality), a non-profit organization, was established to provide free and low-cost resources such as meditation instruction, retreats, and lectures. CRS Learning Center, a suborganization of CRS, owns and maintains the Student Union, providing facilities for course participants. See Visitor Accommodations for reservations information.